c r e d i t s: music: Esther Lamneck – Eugenio Sanna | recording: Vecchio Mulino Recording Studio, Balbano, Lucca, Italy, August 2006 | executive producer: John Rottiers | photos: Beatrice Milani | concept: Gianni Mimmo | graphics: Mirko Spino | production: Gianni Mimmo for Amirani records. Ms. Lamneck is an established virtuoso on clarinet and taragato, as well as an advocate of contemporary music and a specialist in working with electronics and tapes. 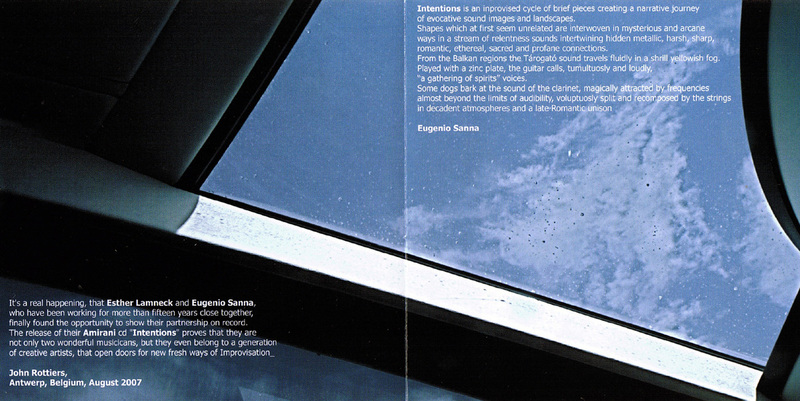 Eugenio Sanna was co-founder of CRIM (Center for Research & Improvvisazione Musicale) and active improviser who has played throughout Europe and collaborated with Ellen Christie. 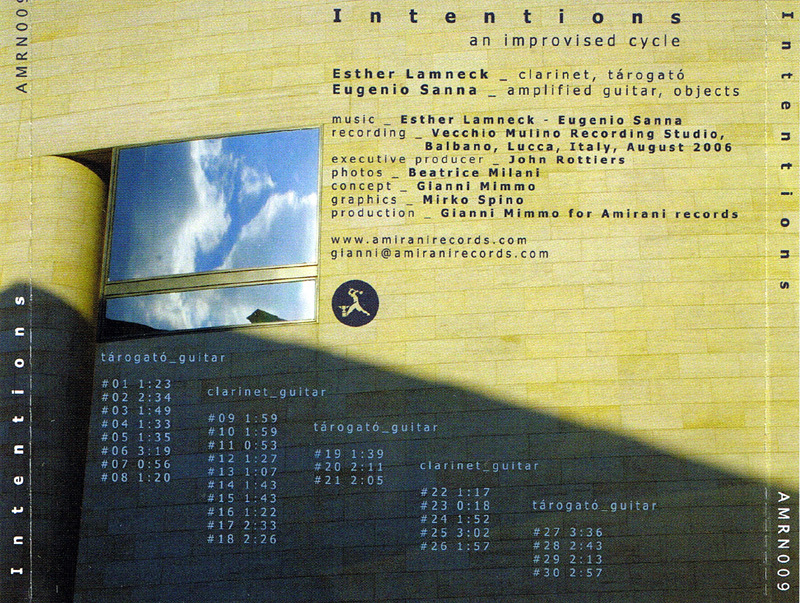 “Intentions” is an improvised cycle of 30 short pieces that create a narrative journey so says the liner notes and that is a good description. While Esther plays a variety of odd and unique sounds on her taragato or clarinet, Eugenio plays an equally diverse set of strange sounds on his amplified or electric (sounding) guitar. Eugenio seems to have a variety of devices to manipulate his sound, creating different distortions and bent sounds on his guitar. Esther does a fine job of matching wits and bending her notes along with his. In a blindfold test, the informed listener might guess Frith and Braxton (or Coxhill) while checking out some of these pieces. Esther is a formidable improviser, often aggressive and seems to push her partner into equally barbed areas of daredevil improvisations. ‘Intentions” is, without a doubt, one of the exciting and creative improv sessions I’ve heard in recent memory. You’ve been warned, it is that good! Subtitled “An Improvised Cycle”, this CD pairs distinct personalities trying to nurture a common ground for intercommunication, with partially satisfying results. Lamneck (clarinet, tárogató) is the artistic director of the NYU New Music And Dance Ensemble, Sanna (amplified guitar, objects) was among the founders of CRIM (Centro per la Ricerca sull’Improvvisazione Musicale) in Pisa, Italy. The instrumental dialogue is intentionally saw-toothed, often frenetic, with rare moments of reflection soon discarded in favour of a stripped kind of anxiety. Lamneck irradiates feelings of incorrigible discrepancy, frequently inundating the environment via itching outbursts showing a piercing sense of reed-fuelled punctiliousness. Sanna operates the guitar following the path of extended techniques that are by now pretty well known and recognizable, choosing selected spots of the instrument to granulate and deteriorate the conventional aspects of playing. On a side, the conversational character of the music is nearly hilarious, two separated neuroses in confrontational mode; on the other, there’s not a really high degree of advance or novelty in what Intentions presents, the title involuntarily symbolizing what indeed remains more or less unexpressed at the end, despite the presence of attention-grabbing episodes. Still, no tediousness whatsoever, which is a major plus.